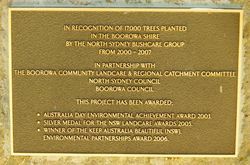 A monument commemorates the planting of 17,000 trees in the Boorowa Shire by the North Sydney Bushcare Group from 2000 to 2007. 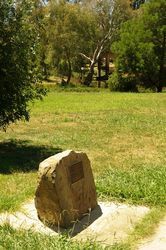 Australia Day Environmental Achievement Award 2003. Silver Medal for the NSW Landcare Awards 2005. Winner of the Keep Australia Beautiful (NSW).